I learned about the race a couple of years ago and finally got the time and opportunity to participate. It seems to draw its inspiration from the Hindu festival of colors in India called Holi. I did nothing to prepare for the race outside of registering (no training or race prep) but it was still a fairly easy run of just over 3 miles through downtown areas of Stone Mountain. Groups of people ran in waves and there were at least 5 color stations where we could get thoroughly doused in pigment. 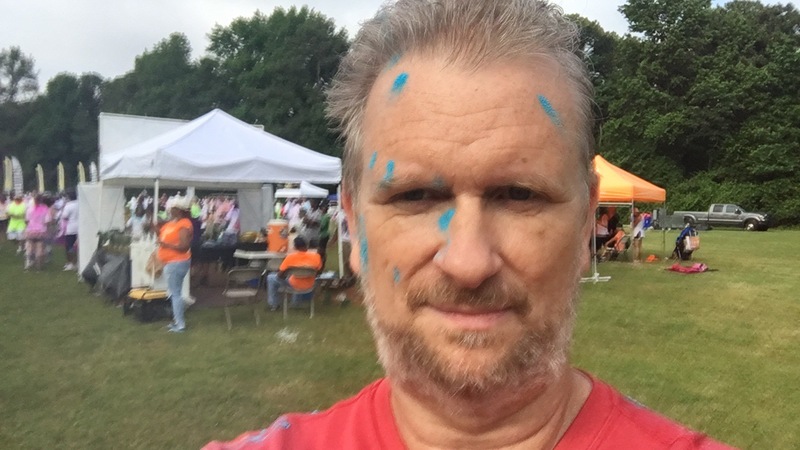 Afterwards racers were invited to stay and party a la Warrior Dash, drinking beer and throwing around more color packets (the pigments are completely hypo-allergenic, water soluble and bio-degradable. By the next good rain, all traces of the colors are washed away).